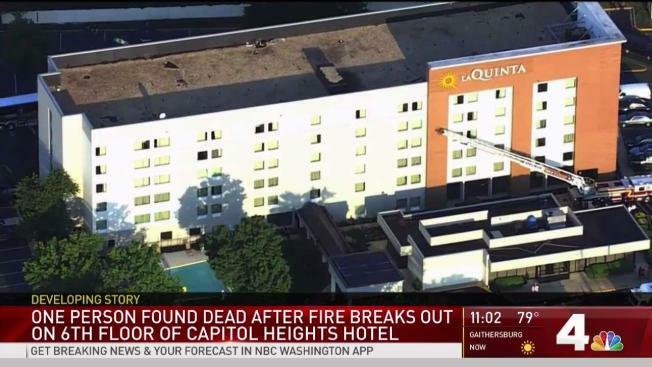 A man was found dead in a fire at a hotel in Capitol Heights, Maryland. Firefighters were called to the La Quinta Inn & Suites at 55 Hampton Park Boulevard about 6:15 a.m. Thursday. The fire started in a room on the top floor of the six-story hotel. "Soon as I get out of the room, I saw the smoke coming out of the room. It was two or three rooms away from mine," said Yves Mercier, who had to evacuatehis hotel room with his wife and friends. Aaron Knox, 36, of Bowie was found dead inside the room where the fire started. A medical examiner will determine the exact cause. Fire officials say the hotel's sprinkler system kept the fire from spreading. The fire was extinguished quickly after firefighters arrived. Losses were estimated at $5,000.